Multi Office / Medical Building. 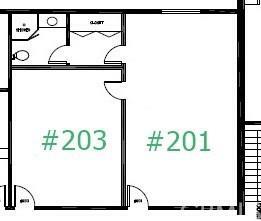 Suite #201 is a 2nd Floor unit, total square feet is 535sqft. Suitable for Doctor's, Chiropractor+GGs, Accountant/CPA's, Architect +G-s & Attorney's.Current tenants include Acupuncture, Internal Medicine, Dentist and an Allergist.No improvements have been made as yet. See picture of floor plan.